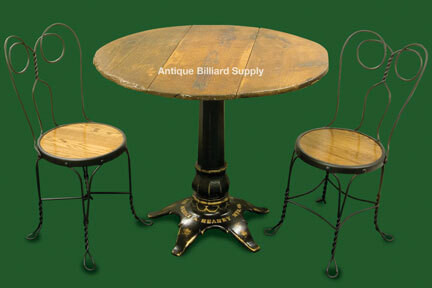 #7-12 Original antique cast iron game table and chairs from the early 1900s. Three-piece cast iron table base shows Merle & Heaney pool table company name and address in raised lettering on the base. Antique black finish with hand-rubbed gold accents. Round top made of primitive pine planks. Matching antique wire chairs with oak seats.